Your dog is the only animal in the world who loves you more than he loves himself. Your selfless pet deserves all the love and more. We’re sure you can understand this as a dog-parent. So, you want to give him the best. When he is ill or down, it breaks your heart. One of the most troubling issues pet owners have is with their dog’s feet allergies. Poor creatures can’t verbalize. It’s for the owners to read their pet’s talking eyes and respond. What Causes Dogs to Chew Paws? Here are some of the common reasons that could cause pain or itch in a dog’s paw, causing him to lick or chew the affected area. In most of these cases, your dog will chew the affected paw. If, however, your dog is licking both paws, or larger areas of a single paw, chances are it’s been affected by an allergy. 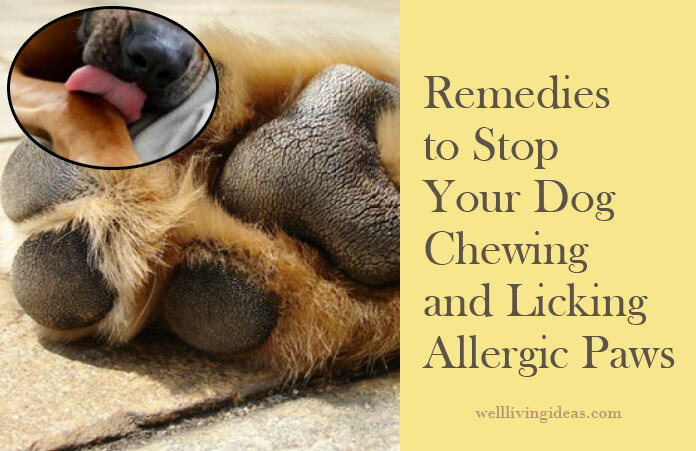 If you find your dog chewing and licking its allergic (2) paws, you know there’a problem, and it’s probably contact dermatitis. 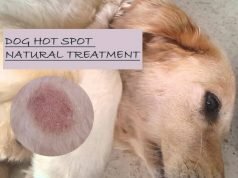 Contact dermatitis is the scientific terminology used to denote an allergic reaction in dogs. Allergens are everywhere. They affect not only humans but animals too. One of the common symptoms of allergies is itching. Nothing comes close to the comfort of scratching that itch. Allergens cause the itch to sink deeper into the skin the more your doggie scratches it. It’s best to put a soothing oil or cream and leave it alone. The itch will go away. It is a bad idea to disturb the skin and scratch. How to stop a dog from licking paws? Your dog is your heart. This darling of yours simply won’t listen to you when you tell him to stop biting and licking that itch. You try telling, yelling and bandaging. Nothing works. His chronic licking is taking the better of you. Your vet’s medication hasn’t helped him much. Now everyone is calling your poor dog ‘itchy paws’. You are frustrated?’ Don’t give up! Before you give up or try healing or soothing remedies, remember the cause of the itch. It is due to irritation caused by the attack of allergens on your dog’s immune system. Have you taken a close look at your house? Your pet may be allergic to something in your home. Investigate thoroughly. Make sure his warm cozy bedding is washed, free from moisture, and is clean. Ensure beddings and floors he steps on are cleaned with disinfectants. Carpets and upholstery must be steam cleaned regularly. Sheets and beddings around the house must be washed and heat dried on a periodic basis. Pets can get an allergic reaction from anywhere. Make sure your pet is not allergic to household detergents or certain soaps and dog shampoos. Allergies can result in various ways, ranging from inhaling or rubbing against outdoor pollen, mold, insects or allergic reaction to pet food. Your dog can carry essentially the same allergies as humans with similar signs and symptoms. So, it should not be very hard for you to find out. Dogs love long walks with their masters. But little does he know that biding time on the lawn or the park may be the cause of his woes. Change his walking trail and see if it helps. The grass or pollen in certain trees can cause itchy paws to your dog. The chemical spray and pesticide sprayed in your backyard could very well be the culprit. Avoid walks through wooded trails. Your pet could be stepping on poison ivy. Also, keep a watch on your dog’s buddies. Your pet may be innocently mingling and playing with another dog in the park carrying allergies from home. If your pet’s buddy is also suffering from itchy paws, he may very well be the carrier. A clean pet is a happy pet. Shampoo him frequently with a prescription shampoo. Your pet cannot speak or thank you. But he can show it in his actions by staying active and healthy. Be sure to shampoo your pet regularly. Frequent cleaning will wash off the clingy allergens. Warm shampoos also soothe the itch and sanitize the paws. Clean and dirt-free paws heal faster. Another smart solution to prevent your dog from licking paws is dressing him up with dog booties/shoes. Your pet will be the envy of the other dogs in the neighborhood. Your puppy would love the warm cozy feeling of walking shoes, especially during the fall season. It keeps his tender feet warm and comfy. Pet booties not only protect your dog’s paws from seasonal changes but also protect your pet’s feet from allergens. It also acts as an extra layer of protection for those bandages and helps the wounds heal faster. Pet booties will also prevent your dog from biting or licking his paws. Several styles of shoes are available online or in pet stores. Have him get into them before you take him for a walk. This is the safest and surest method to avoid contact with outdoor allergens that could be contacting his skin and causing the itching. Doggie booties also protect your dog from cuts, bruises and foreign matter that could otherwise embed in his tender feet. Young puppies are especially more vulnerable as they have tender feet. Oatmeal has great moisturizing and anti-inflammatory properties. If you or your family member have ever had chicken pox, remember mom would have given you an oatmeal bath? Soak a cup of ground oatmeal in warm water and have your pet dip his paws or sit in it for 10-15 minutes. The moisturizing property will soothe the skin and the warm water will relieve the itch instantly. Dilute iodine with water just enough to resemble the color of ice tea. Iodine has strong disinfectant and anti-fungal properties. Soak the paws for about a minute. This will instantly relieve the itchy paws bothering your pet and help heal from any fungal or yeast infection between the feet and paw pads. Once your dog steps out pat dry the paws. Do not wash it. Let the medicine continue to work on those paws. Iodine is non-toxic for pets so don’t worry about the after-licking. It is one handy kitchen ingredient that can be a solution to so many problems. Baking soda works like magic for restoring the PH balance in the immune system helping the body to cope and fight allergens. It is alkaline in nature, hence neutralizes acidic substances which are host to multiple health issues which include acidity, allergic reactions etc. Make a warm solution with 2-3 tablespoons of baking soda and 2 litters of water. Dip the paws for about 1-2 minutes. Baking soda will remove the itch-causing allergens and soothe the inflamed and irritated area. Apple cider is the mother of all allergen eliminators. It uses and medicinal value are no secret. It is a great recipe for a number of ailments. Apple cider vinegar is a natural remedy known to treat poison ivy rashes. It soothes the rash and gives instant relief. This is because apple cider vinegar contains potassium which helps in reducing swelling and associated with poison ivy. It is also great for those rashes associated with bugs and flees. Pour 1 cup of apple cider vinegar and 1 cup of hydrogen peroxide in 2 liters of water and let your pet’s paws soak for a minute or two. While hydrogen peroxide acts a dirt and allergen magnet, the apple cider vinegar washes them and soothes your pet. Pick him with love and pat dry his paws. A great time to bond! This homemade recipe is great for soothing that stubborn dog itchy paws yeast With all the goodness of apple cider vinegar, the natural acids in the lemon, and soothing and anti-itch properties in the peppermint pit, your pet is sure to feel like a king in a spa. Add the juice of one whole lemon, 1 cup apple cider vinegar and about 15 drops of the therapeutic peppermint oil in 2 liters of warm water. Soak your dog’s paws in it for about 1 minute for best results. This solution can make a great household cleaner. Its natural acidic balance works hard on the bacteria around the house, by killing the germs and keeping the house spotless. A clean house is an allergy free house. If you are an avid surfer, you will know how the salty sea water helps heal those cuts and wounds so fast. Salt has great disinfectant, anti-inflammatory, and healing properties. Dissolve a cup of common salt in 2 liters of warm water completely. Let your pet’s paws rest in it for about 1-2 minutes. 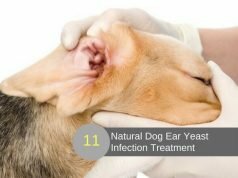 With this treatment, the healing properties of iodine and sodium chloride begin to work instantly for your dog. Dissolve a cup of Epsom salt in 2 liters of warm water. The potassium nitrates and chlorides present in Epsom salt will restore your dog’s natural good bacteria and PH balance, killing the rogue bacteria causing the itching, thereby relieving the symptoms and inflammation. It also helps the bruising and wound caused by biting. But be careful to inspect your dog’s paw before you dunk it in any salt solution. Make sure there is no fresh blood. Ensure the wounds, if any, have clotted before you dip. If you have your dog licking paws raw with blood on it, this solution should be avoided. Use a new litter box to help relieve his itch and discomfort when you are making warm water solutions. If time is your constraint, it’s not a problem. Simply make a solution of any of the above-recommended recipes, put them in a fresh spray bottle and spray as and when required. This handy dog paw disinfectant can also be used on the go. 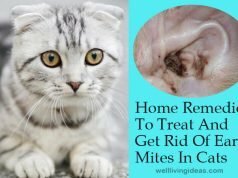 Try these home-tested and sworn-effective home remedies for your dog’s allergies, causing him to chew feet.. Incessant itching can become habit forming. To avoid this vicious cycle, play with your dog and keep him engaged as often as you can. With his mind off his itchy paw, he will be able to forget it eventually, thereby letting the wound heal. Remember, underlying itchiness caused by allergens is a result of constant licking and paw-biting of your dog. Excessive moisture due to licking and bruising due to biting will only exacerbate the condition. It will eventually play host to pathogens like bacteria or yeast infections. Itching, biting and disturbing the skin will further worsen the condition. Pay close attention to your pet’s mannerisms and take the necessary actions without delay.